On 20 April 2010, the Deepwater Horizon (DWH), an ultra-deepwater offshore oil drilling rig, exploded due to a blowout. On 22 April 2010, the DWH sank to the sea floor, leaving an open line to large oil well that caused the largest offshore oil spill in US history. The Upper Ocean Dynamics Laboratory has been instrumental in the research response from the begining. Members of the UOD were mobilized immediately to deploy nearly 600 Airborne Expendable Bathythermographs (AXBT), Airborne Expendable Conductivity/Temperature/Depth (AXCTD), and Airborne Expendable Current Profilers (AXCP) from a NOAA P3-Orion aircraft for three months following the rig explosion. 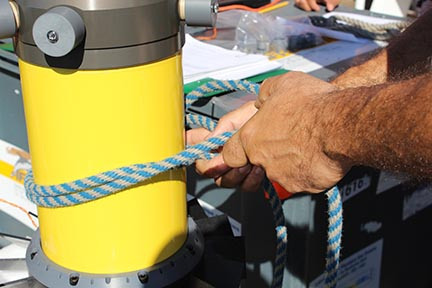 The UOD lab was involved with the initial Consortia call for research proposals, collaborating with other scientists in Deepsea to Coast Connectivity in the Eastern Gulf of Mexico (DEEP-C) . And researchers continue to investigate ways for better emergency response and impacts of circulation on the biochemical properties of the ocean in GoMRI's Three-Dimensional Gulf Circulation and Biogeochemical Processes Unveiled by State-of-the-Art Profiling Float Technology and Data Assimilative Ocean Models. To follow the media coverage, please visit MEDIA.